The township of Orwell was organized on July 27, 1886, by the county commissioners under the name of Liberty. For many years prior to its organization as a separate township it had been known as West Buse, and it is so called in the petition of the citizens asking for its establishment as a civil township. The petitioners asked that the township be called either Huron or Ridgway, but "the commissioners selected the name of Liberty for the organized township, as it seemed to them that the voters of the township did not quite agree on any name of their own selection." The first election was at the school house on section 22, on Saturday, August 14, 1886. When the name of the new township was reported to the state auditor the latter official, in a letter dated August 7, 1886, reported back to the county auditor that the name Liberty was rejected on the ground that a township of this name already existed in the state. Thereupon the commissioners on November 3, 1880 ordered the name changed to Orwell. The following qualified voters signed the petition for the establishment of Orwell township: Edwin M. Wright, William Winter, Lars Ouse, D. Burrows, W. P. Colvert, J. Welborn, Charles Russell, Thomas Carem, Charles B. Soule, John Woodfuff, M. P. Burrows, T. B. Ortendorf, Karl Heidgeken, H. Eikens, A. Svein, Charles Jackson, A. Lunde, Nils Petterson, Simon Olsen, S. Helander, James Knowles, S. J. Hylander W. W. Randolph, Olaf Engetriom and Peter Petterson. Orwell was next to the last township organized in Otter Tail county, a fact due to the swampiness of the township. 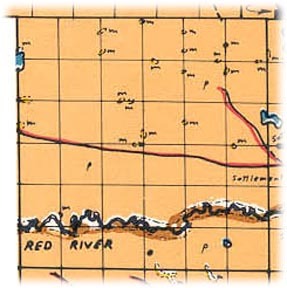 Red river runs through the township from east to west through sections 25, 26, 34, 28, 29, 32, 30 and 31, leaving the township and county near the line dividing sections 30 and 31. Rush lake is the only body of water of any considerable size, although there are several other small lakes within its limits. The landowners in 1880, as taken from the tax duplicate of that year, included E. W. Dewey, Eustace Cummings, J. A. Bell, E. S. Allen, N. P. Clark, B. B. Parsons, William Russell, E. P. Brainard, J. G. Smith, D. Stewart, W. H. Potter, F. S. Burnham, C. Tower, D. S. Wemple, Addison Hilton, John Nelson, L. Sherat, F. W. Woodworth, J. M. Scott, S. Garland, W. J. Van Dyke, William Elliott, William Taylor, L. Lathrop, David Hume, A. M. Ridgway, H. C. Menshing, T. J. Wiley, Fannie S. Burnham, A. Hennington, B. B. Parsons, John Larson, F. M. Rose, William Ridgway, Nels Holmgren, M. C. Davis, W. H. Bradford, P. McMaster, J. H. Grass, Lawrence Brainard, J. H. Holmes, A. Holes, P.O. Ryden, A. C. Vanderburg, William Kingston, H. Roberts, F. B. Van Hoesen, A. F. Wentworth, W. R. Lewis, C. F. Davis, Frank A. Gilmore, Fred Winter and James Knowles. The largest land owner was the St. Paul, Minneapolis and Manitoba railroad. It must not be understood that all of these taxpayers lived in the township at the time, since it is certain that only a few of them lived on the land they owned. There has never been a village platted within the limits of the township and it has never even had a postoffice. The present township officers are as follow: Supervisors, John Gander John Westerberg and Frank Noyes; clerk, B. R. Scott; treasurer, E. J. Scott; assessor, Fred Veit; justices, J. J. Martin and John Albright; constable, Fred Noyes. Places of birth for Orwell Township in the 1905 state census.